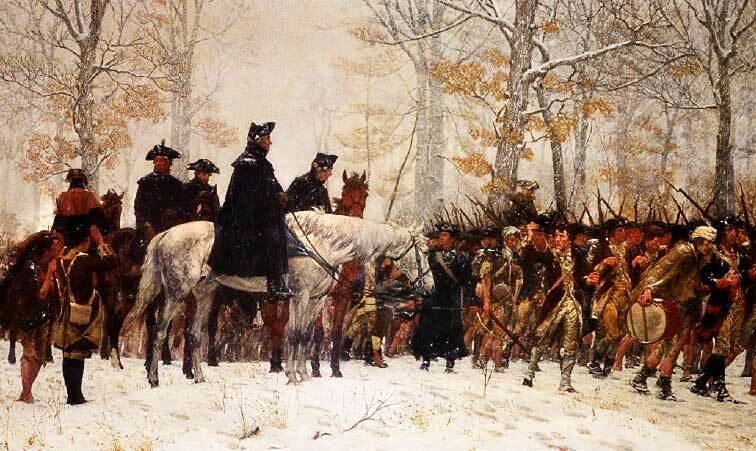 George Washington leading his men at Valley Forge. Painting by William Trego. February 22: My parents, who both came from southwestern Pennsylvania, were married on this day in 1942. Mom always said the reason they picked that day was so they would always have the day off. Dad said it was so he would never forget their anniversary, I suspect they were both right. My parents grew up celebrating the birthday of our First President, George Washington. It was a day worth celebrating, worth remembering. Today, his birthday is hardly mentioned. Some radio stations mention this as being Our First President’s birthday, but I fear for most, this day’s significance has just become another bit of trivia that doesn’t mean squat to the young. Even worse I fear they don’t even know who George Washington was or what he accomplished. A few weeks ago I was at local carryout pizza parlor. The bill was $18.11. Gave the guy a $20 and before he had could put the bill into the cash drawer, I handed him 11 cents. He said, “Sorry, I already keyed in the $20.” So instead of accepting my two coins, he had to count out 89 cents and a dollar bill. I’m sure the young kid could have figured it out, but then maybe not. Today’s youth have been so coddled, so infused with a sense of entitlement, and so empowered with their electronic devices, there’s no reason for them to know anything. With everything at their fingertips, why waste all that valuable real estate in their head with trivia, and after all, isn’t at that stuff that came before them just that: trivia? My father’s logic came true. In 1971 Washington’s birthday was relegated to just another date in history and in 1996 for whatever reason he forgot that day was his anniversary. We no longer honor our Great Leader on his birthday, instead we just lump him together with all the other forty plus men who have held that office at sometime. No matter what they accomplished or failed at, they are all honored on President’s Day, some nondescript Monday in February when a few get to have another long weekend. For those that never knew today was George Washington’s birthday, or can remember it was once a day when all Americans celebrated his birth, here’s a few of the reasons we did so. Without George Washington’s contribution before the founding of the country, there very well would not have been a new country. At a time of revolution, it was George Washington that stepped up and took a radical concept of a relatively few radical thinkers mostly from New England and made it possible for those ideas to become reality. The man was a natural leader, not a great general, but a leader. His men followed him regardless of his military mistakes. The war began in April 1775. Two months later, Washington agreed to lead those men willing to fight and on June 14, 1775, the Continental Congress appointed him commander of what they called the Continental Army. It would take six years for all the military pieces to fall into place and for Great Britain to give up their colonial plans. In 1789, seven years after the end of the Revolutionary War, George Washington was elected the First President. He could have been a king, a dictator, a chancellor, he could have been anything he wanted to be– this is how powerful this single individual had become in the eyes of his fellow citizens. George Washington chose to become the President of the United States. It was his ideas on how the President should act, the duties that he would perform and it was idea that the United States should have a strong military, despite the fact that there were some in Congress who feared the military could take control of the country at some point and that the President would be the Commander-in-Chief of our military forces. George Washington was one of the major reasons the United States became a reality. Not only did he serve as its First President, but it was his ideas on how the office should function, that has been carried on since those early years of the country. Today, we celebrate this man, the First President of the United States of America. He deserves a day, his birthday, when we can pay tribute that should not be lumped together with all the other presidential office holders. Enjoy reading your story. Yes it is sad about today’s young (and some not so young) accting like everyone owes them. (I can’t imagine what it will be in 20 years). Sorry your Dad forgot his anniversary in 1996…but this made me laugh. Pride is what is missing in many. So I have been retired three years and am going to spend time in my state Ohio…and maybe some in Pennsylvania also…. I am buying a cargo van and making my travel tiny home…so when I get tired I can take that nap. Good ole George Washington…may he RIP…but I fear he is not.